On the same day of Turkish double-face Davutoglu’s visit to Gaza, the highly dense concentration strip which witnessed the worst aggression by the terrorist rogue state of Zionist settlers israel where the Turkish Muslim Brotherhood government FM shed a lot of tears, on the very same day a naval bridge was established from Syrian port of Iskenderun under Turkish occupation but not to Gaza, it was established to israel’s Haifa port. The new bridge was meant to bypass Syria to Jordan, Saudi Arabia and Egypt and reward Zionist israel for its crime against Gaza besieged civilians in the second holocaust within just 4 years. 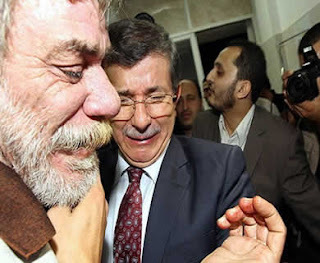 Turkish economic relations with israel saw a considerable growth under the Muslim Brotherhood government of Turkey under Receb Teyyib Erdogan especially after the Ravi Marmara piracy act by the israeli commandos 31 May, 2010. What did Turkey offer Palestinians in Gaza again?